Julia Vera is founder and Managing Director of Travelecoology, a travel agency that seeks to build and nurture positive links between tourism and environmental conservation through ecotourism. Travelecoology is the Managing Partner of WILDSEA Europe, a public-private network of tourism destinations and operators that are working together to foster marine ecotourism in Europe and to improve Ocean Literacy through responsible tourism. 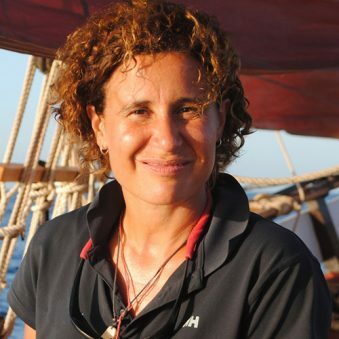 Julia is co-developing SOPHIE’s Citizen Science Program, which will be rolled out through WILDSEA Europe’s network of marine ecotourism operators in the UK, Ireland, Portugal and Spain. Previously, Julia has held management responsibilities in organizations such as Fundación Biodiversidad (the Spanish Ministry for the Environment) and Fundación Entorno (Spain´s Business Council for Sustainable Development), as well as having worked as international consultant for firms such as KPMG. Her passion for travel has led her to guide in Tambopata (Perú) and to work as a Tour Director in Europe. Julia holds an MSc in Economics from the University of Amsterdam (The Netherlands) and a degree in Business Administration from HES-International School of Economics of Rotterdam (The Netherlands).